While the United States of America is many things to many people, it is not as is popularly conceived a Democracy and it never has been. This view is not coming from a perspective of politics, but one of stark reality. The thinking of the overwhelming majority of our Founding Fathers, as embodied in the Constitution they wrote, was certainly not to give power to the masses. I don’t believe this point is in dispute by the majority of Constitutional experts, despite their various positions on the political spectrum. Most politicians with self-awareness and intelligence have always known that we are not a Democracy as a country, despite the fact that most also proclaim it to be a Democracy. The problem with what I just wrote is that defining Democracy is a very slippery process and as I will show, the word means very different thing to many different people. Permit me to begin by defining Democracy in terms of the myth that has been created around it in American parlance: “Democracy represents both the Will and the Rule of the People over their government. As such it is the best form of government for all”. Whether we believe it or not all Americans have grown up under this national myth and its’ use is ubiquitous to both domestic and foreign policy. The many wars this country has fought were prosecuted in the interests of this myth of Democracy, whether in destroying the Axis in World War II to save the world, or to nurture its creation and existence in numerous foreign lands. A student of history understands that the reasons for the wars America has fought are far more complex and ultimately self-serving than protecting Democracy. Nevertheless, to initially go to war, a populace must be energized by the belief that it will be fought for a higher purpose, in order to send it young adults to fight and potentially die. This energy in America usually has come from a combination of the myth of protecting democracy and a general threat to all the people. The simple rubric in my lifetime and in the history before it, is that we are fighting for Democracy. I will explore this myth, so central to our lives of citizens and discuss its implications. This illustrates the problem that America has with Democracy both as a rallying point and as a guiding myth. Most of us were reared and educated with the idea that “Democracy is the rule of the people”, even though in practicality that is simply not true. In the area of guiding mythology though, that particular myth has been used time and again, to justify many evils and sometimes even promote good. In realistically looking at our country and Democracy, as with much else in life, I believe context is everything. The American Revolution was fostered by the wealthiest people in this country, who initiated it because they were economically and socially stifled by the rule of a Monarchic Empire. They were highly sophisticated and intelligent men, whose charisma and standing in their particular States, was unquestioned. They used the promise of a “free republic”, end to tyranny and even the inclusion of the populace into decision-making, to rally popular support. That support was far from universal, but nevertheless those we call the “Founding Fathers” prevailed. When I first learned America History my particular hero was the radical Samuel Adams. It always seemed curious to me that after the Revolution his role in the body politic became obscure. As my knowledge of history grew I came to realize that my hero was far too much a threat to the interests of the Founding Fathers, to be allowed a role in the Constitution and the governance of this new country. The exclusion of Sam Adams and others of his radical ilk is the proof that this was not to be a country where the common people would have ultimate power over their government. The Constitution makes no mention of Democracy; it is a document that creates a particular type of Republic, where the power rests in the hands of those of wealth and property. 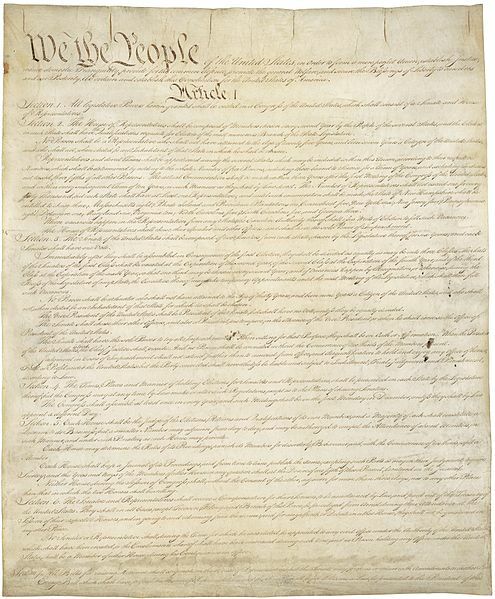 It is nevertheless a magnificent document that was unprecedented for its time and well into the future, even today. Democracy, however, was the myth used to convince the masses to love and support their country. It has been used as mentioned to justify war and foreign interventions. The supposed protection of Democracy has even been used in the Patriot Act to actually threaten most American’s constitutionally granted freedoms. When William F. Buckley, founder of the National Review and PBS fame first became prominent in the 1950’s, he was roundly chastised for insisting that our Country was a Republic, not a Democracy. In other words, Buckley, who in general I have no respect for, was correctly denying the unifying myth of our country. In the process of that denial and its effect on conservative thinking, it was seen at the time as scandalous. I think that the idea of the United States being a Democracy is a myth that needs to be de-mythologized. I believe, however, in the idea of the need for the populace to have a greater say in the processes that govern us. I’m tired of the oligarchy that has always ruled our country for its benefit and the citizens’ distress. A large part of the seeming legitimacy of that rule is the myth that we are a democratic society. To even begin to achieve this power for the people, we must educate us all on the real state of affairs and try to proceed with reality and not myth. What do you the reader think about this and what are your preferences for how this country should be run?